Symposium Technologies is proud to announce the implementation of the Horizon EME Dispatch solution for COMM Fire District of Cape Cod, Massachusetts. The system seamlessly integrates and distributes data from many different sources, and provides the district with a centralized, integrated decision support system that greatly increases the speed and effectiveness of response. The COMM implementation is also a prime example of how a dispatch system can successfully accommodate the needs of many different departments, while still enabling each one to maintain separate workflows, operating procedures, and reporting. The system currently dispatches 45 fire and EMS apparatus from 4 halls. The system is also configured to provide mutual aid dispatching for the surrounding 10 districts and their 93 apparatus, accommodating the complex response rules of each department. The Horizon EME was fully implemented in under three months – half of the six months schedule originally envisioned. This is even more impressive when considering the fact that the system was fully customized to reflect each department’s operations, and that the project also involved roll-out of three different RMS implementations, each fully integrated with the CAD. 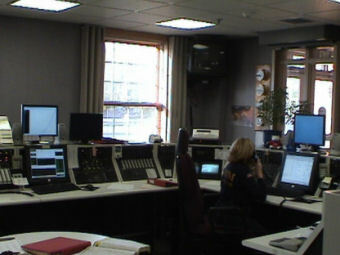 Dispatchers now have access to a wide range of capabilities, including full interactive mapping, unit and response information for each of the participating departments, and real time access to premise and inspection information collected by each department throughout the year, and stored in the Firehouse™ RMS system. Because the EME dispatch system is fully customizable, it can easily accommodate any expansion in the number of departments served, as well as being able to accommodate any increase in call volume or workload – an important fact due to the extensive mutual aid agreements that COMM participates in. Work at COMM is ongoing to provide even higher levels of capability. The second part of the project involves rolling out mobile data to the district’s fire apparatus, so that responding personnel have access to full incident data, including interactive mapping and incident updating, GPS-based vehicle location, as well as instantaneous information sharing with the command center and other responding vehicles. The result will be an even quicker, safer, and more effective response. The project showcases many of the most progressive and practical applications of advanced technology in the public safety field, and highlights how Symposium’s Horizon EME can be utilized to cost-effectively improve operations and safety.